The characteristics of good wrap design and vehicle advertising — those which use proper branding, and easy-to-discern messaging — are rarely employed on most vehicle wraps seen on the road today. This explains why many wraps are failures from an advertising standpoint, and sadly a wasted opportunity for the businesses deploying them. This can be primarily attributed to a lack of education and understanding about the actual medium. In years past, the prerequisites for billboard painters and truck lettering artists were years of study and apprenticeships. Mastering the craft is a bit easier today, since the primary barrier to entry is acquiring the cash to buy a large format digital printer. So, while the sign or wrap company may be brilliant at installing wraps, they may lack experience in the study of effective advertising in an outdoor realm. The following rules can help you better understand the fundamentals for good wrap design and vehicle advertising. Whether you are a designer hoping to improve your layouts, or a small business owner trying to gain market share, these tips will help you get the maximum impact and return on investment for your outdoor vehicle advertising programs. 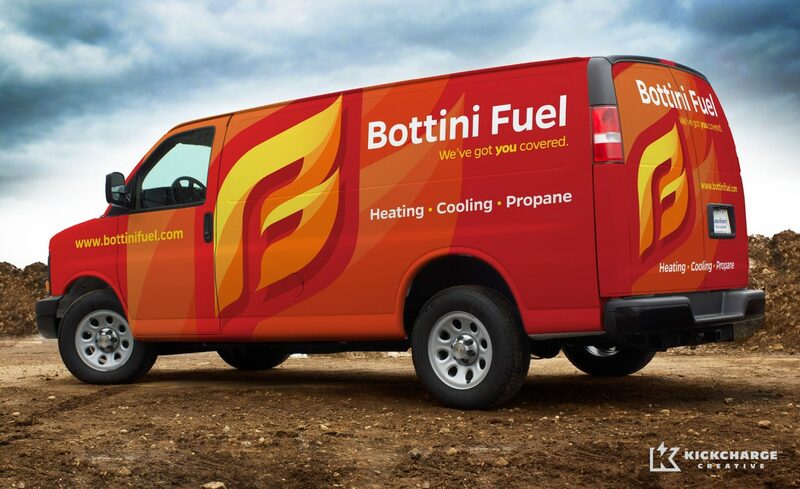 New brand development and fleet branding for the NY-based fuel and HVAC business. The fleet consisted of 75 vans, oil tankers, and propane trucks. One reason that so many wraps fail from a marketing perspective is because the business has a poor brand identity and logo. The brand should always be the primary message for a vehicle wrap, unless you have national brand recognition. For small businesses trying to make an impact in their community, the message is always about the brand. Starting with a poor brand means you’ve failed before you’ve begun: by wasting money on a wrap and missing a huge marketing opportunity. We generally only do wrap design for clients whose brands we’ve created, because companies who come to us with an existing brand often have a terrible one. And if they won’t change it, we won’t design it. What is surprising is that we are usually the first ones to tell them that. I guess the other sign companies never mention that because they don’t want to lose the job. While I can understand that, a surprising number of clients really appreciate the candor and the fact that we only have their best interests in mind. It’s too much money to play with. I’m certainly not going to be responsible for wasting your money by trying to work with a brand that has no business being implemented on a wrap. The brand is the message, period. 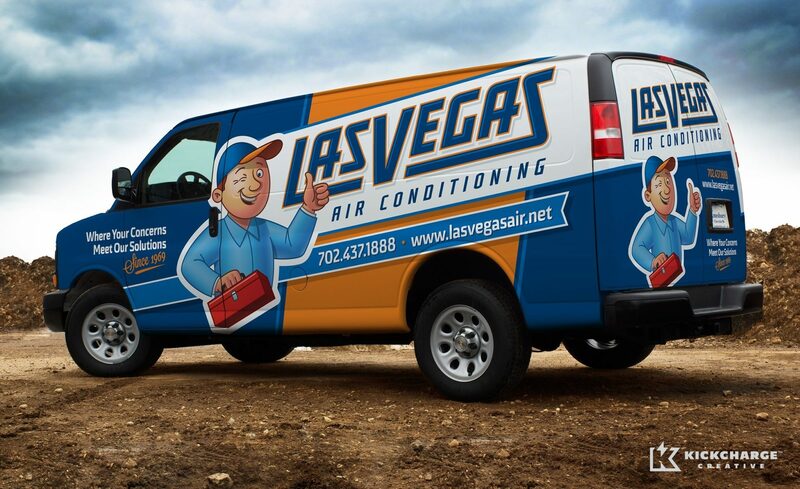 Take the usual examples, like the HVAC contractor with a picture of an air conditioner. Great. Now I know you do air conditioning, but who are you? I don’t know, because I only have 2.5 seconds to view the message. Or consider the contractor and the picture of a house. Great. A house. But are you a siding company, a roofing company, a window installer, power washer, a landscaper or an electrician? I have no idea, since the photo is the dominant element. After my 2.5 seconds are up, your message is lost amidst all the other things trying to grab my attention. Perhaps on box trucks or trailers you can use a photo, but I’d still argue a more powerful brand integration would be more effective. National chains have an easier time using photography, because, once again, their brand is already known and the message need not be 100% focused on who or what the brand is. Small businesses don’t have this luxury. 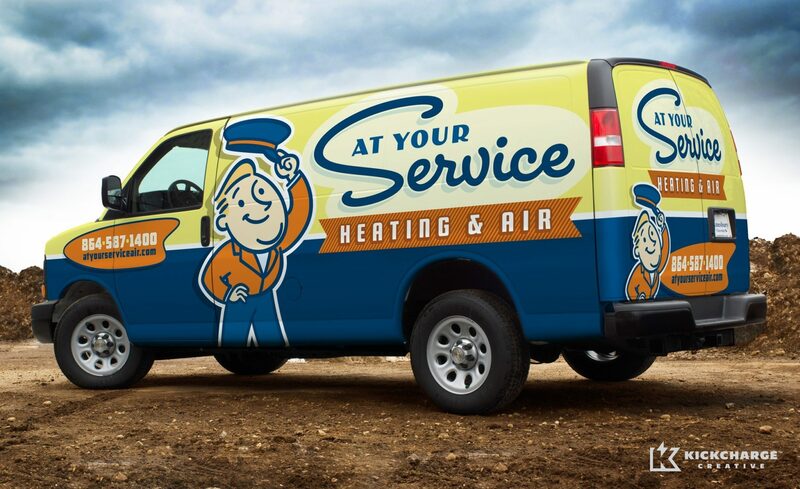 The best logos make for the best truck wraps as illustrated by this HVAC company in Spartanburg, SC. There’s only 3 or 4 things a good wrap needs: strong brand implementation, and perhaps tagline messaging, a web address, and maybe a phone number. Bullet lists, which look more like shopping lists, have no place on a vehicle. This isn’t the yellow pages. Would you rather list 10 things and have none remembered, or convey one to two memorable takeaways? If this truck were a billboard, how much copy would be on it? Billboards have the exact same challenges as vehicle advertising. If you prioritize your copy, it will be more effective. In general, the hierarchy should always be: BRAND, TAGLINE, WEB and/or PHONE NUMBER. This isn’t the part where many might say diamond plate, carbon fiber, tribal flames will make your truck wrap stand out. Quite the contrary. By eliminating all those fills, noisy backgrounds, photos, bevels, and glows, you’ll be on your way to designing a wrap which actually stands out. The wrap market is littered with visual noise. When we see something with impact — something that we can actually read and remember — it can’t help but stand out among the visual clutter. That’s what is so ironic to me. People think our vehicle wrap designs are innovative simply because they are unlike what everyone else seems to be doing. So — they stand out. 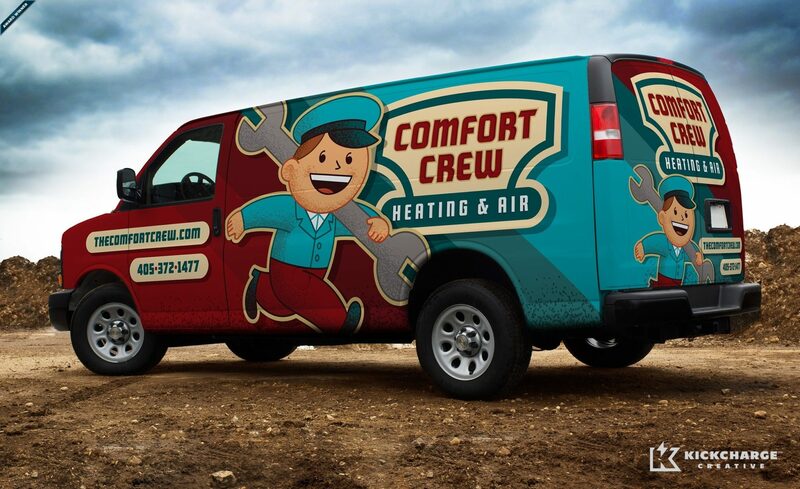 One of our best vehicle wraps for a heating and air conditioning company utilizing retro branding and logo design. If the viewer needs to work too hard to figure out the primary brand messaging, it’s an opportunity lost. The medium isn’t the same as print design, where the viewer can stop, absorb the advertising and try and understand the message. Consider that one, primary takeaway you’re hoping to leave with the viewer. What is it? And does the wrap effectively communicate it? Is it lost in the imagery? Distance legibility is, of course, a primary concern. You have very limited time to capture the viewer’s attention and have your brand and message be understood and remembered. Click here for more examples of effective vehicle wraps.